Knowing that programs don’t change kids and that relationships do, we connect students to caring adults who offer encouragement, academic support, and hope. Creating safe, nurturing space for students’ learning and helps them achieve their potential. Linking students to vision and dental exams, social/emotional supports, and other basics are pre-requisites to growing healthy people. When basic needs are met, students can better focus on learning. Providing tutoring, literacy programs, career planning, employment training and job shadowing, leadership skills training and our unique Project Success college readiness program gives students the skill set necessary to be success in today’s workforce. Providing students opportunities to share strengths, talents, and time with others, by volunteering, tutoring younger students, and other ways helps young people feel connected to their community. We look for ways to provide. Students aren’t at their best if they are hungry, cold, tired, or don’t have the necessities, like clothing, school supplies or hygiene items. 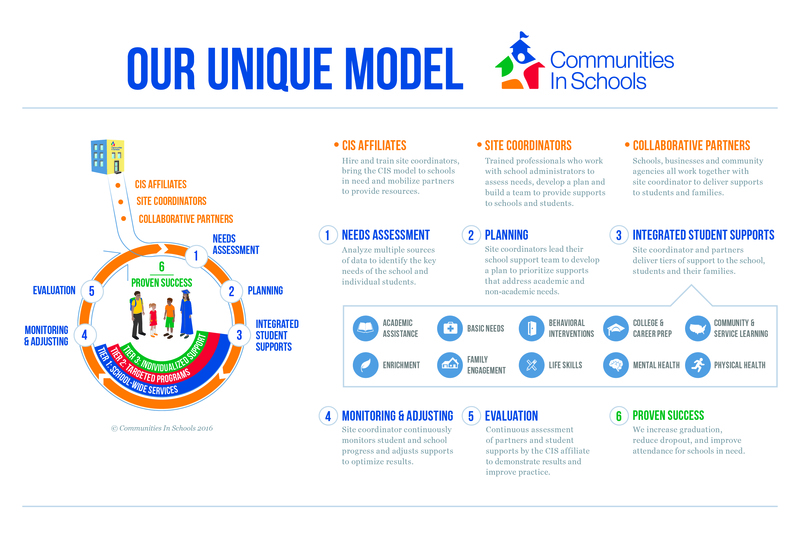 CIS Site Coordinators see to it that students can focus on learning and teachers can focus on teaching. Sometimes students just need a little assistance to lift them to success. We connect students with the extra support they need to succeed. Healthier children make better students. It’s hard to focus on math and reading if a student can’t see the blackboard, is suffering from mental health issues, a tooth ache, or absent because of untreated asthma. Addressing health and mental health needs with the help of our community partners keeps students in school, focused, and ready to learn. We want students to approach people and challenges in healthy ways. How do you learn to pay attention? Solve problems or conflicts with others? Be persistent in the face of frustration? Our students are learning these and other critical life skills thanks to relationships with CIS Site Coordinators. Both higher education and the modern workplace are evolving rapidly, and with this shift come new opportunities, greater competition, more complex skill sets, and job titles that didn’t exist a few years ago. It’s a lot to process, especially for students already dealing with their own unique challenges. For students pursuing college, we help decipher the application process, explore scholarship opportunities, tour campuses and conduct mock interviews. For those planning to enter the work force, we help students discover enjoyable, sustainable career paths and connect them to internships, job shadowing opportunities and leadership training courses. For those undecided, our Project Success coordinators provide a safe sounding board to articulate goals and fears, and explore options. Success begins in many ways.